For this test the boxed camera and a boxed PoE injector kit were supplied together with a pair of RJ45 patch leads and three documents; these were a Mobotix Product Guide (Access Control and CCTV), a specification sheet for the PoE injector and a Q25M camera manual. 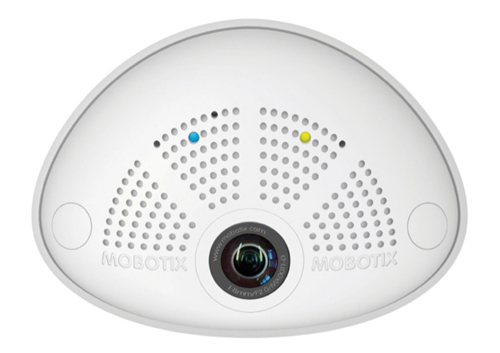 While the i25 could be thought of as a cut-down version of the Q25 this was not explained and indeed it was found that the Mobotix website only provides the Q25 manual under the “Hemispheric i25” support tab. This 156-page manual is very comprehensive but makes no reference to the i25 camera and its differences. This camera model is an internal wall mounted 180° viewing version that follows on from their successful Q25M internal / external camera that provides a ceiling mounted 360° view. The camera case is off-white with small flecks that give a slightly dusty appearance but this may help the camera to blend into its surroundings. The camera forms part of the Mobotix “Decentralized Video System” concept and therefore is ideally suited to a Mobotix based system or as a stand-alone device; it can supply M-JPEG streams to third party recording systems but does not support ONVIF or PSIA protocols. Streams are intended to be provided using M-JPEG or the Mobotix proprietary MxPEG image compression protocol. The camera and its packaging lacked any form of serial number, so this may be an issue for traceability, particularly on large installations. Apart from a manufacturer’s bar code that is not given a text reference, the only identifier given where you would expect a serial number to be placed is a factory IP address, no MAC address that could be used as an end-user or installer unique identifier is printed. The supplied memory stick had around 2.5GB of files but no simple start Menu or Install file. Six executable files were in the root folder including an MxCC.exe Control Centre program that encouragingly could be run directly from the memory stick without installation onto the PC. The camera is designed to produce a very wide angle panoramic view from its fisheye lens. This can then be displayed in various screen options. The wall-to-wall view can cover a whole room with the image corrected to remove any lens trapezoid distortion. The 5MP sensor gives good image resolution and allows a virtual PTZ operation to be performed on the live or recorded image. The image had good horizontal linearity when mounted vertically and was measured at just over 180° horizontal field of view. Oddly the camera is available as a colour-only or monochrome-only version with the mono version being quoted as a much higher sensitivity. It is unlikely that many UK based installations would request a monochrome view for such a camera. Once connected via the PoE injector the camera went through a start-up routine with two front mounted LEDs giving a status indication. The left hand LED was permanently green while powered and the right hand LED was red for approximately 45 seconds before being extinguished. There was no information on getting images from the camera in the operation guide but simply connecting a browser to the factory default IP address given on the back of the camera quickly connects to the camera giving an image in a Mobotix browser window with a range of on-screen menu command tabs. The Q25 manual has “First Images and the Most Important Settings” on page 115. The user and password for the Admin and Setup menus are provided in the margin on the same page of the manual. Once entered the Admin menu gives access to an Installation Wizard and basic settings and accessibility. The Setup menu gives a wide range of image control and quality settings along with a variety of Event control features and Analytics settings. Events can be triggered by video content, audio level from its internal microphone or by network based triggers. The camera can be used in a Master and Slave mode to trigger multiple cameras once one is activated. Recordings can be stored locally on the internal Micro SD card (Up to 64GB capacity) or to a USB connected external drive. In addition to the output stream an FTP (File Transfer Protocol) destination can also be configured to save JPEG images by schedule or on event. This colour version gave good results in an office environment down to just under 5 lux although at this level AGC noise was very evident. Either through a conventional internet browser or with the free Mx Control Centre software the camera has a range of viewing modes that can be used to display the whole panoramic image or selected views from the scene. Each of these views can provide a virtual PTZ control around the total image or simply a selection of preferred scenes such as room entry points. Changing the Micro SD card involves removing the single-PCB based camera from its casing but this is straightforward if the instructions are carefully followed. Sound can be recorded via its in-built microphone and there is an option to fit a small loudspeaker into the camera body or to use the audio output to drive an external amplifier or to interface to an entry-phone device. This camera fits well into the Mobotix range and their concept of distributed activated recording. The UK still has an apparent preference for recording centrally and continuously so that there is a complete record of all activity and inactivity so this camera will more likely appeal to prior users of the Mobotix approach or those looking for a cost effective flexible IP recording solution that has no additional licensing costs and due to the local recording can be accessed by basic PC or smartphone technology. The image quality is very good and the flexibility of its analytic capabilities and event recording features may appeal to users who are prepared to spend time carefully configuring this unit to suit specialist applications. The lack of any ONVIF compatibility will potentially limit sales to customers with Mobotix based systems, stand-alone applications or those with third-party controls that have incorporated Mobotix protocols.